The couple magic mug with the handle design of girl and boy logo is a special mug design for her/him. This magic mug or Color Changing Mug works just like a magic when you pour in hot water into the mug, the photo and message you printed on the photo magic mug will be slowly...slowly...revealed. Sound interesting? 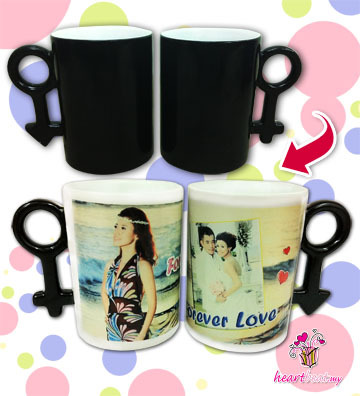 Pick one couple magic mug and template design today, and we will free design with your selected template design & and free photo touching for you.